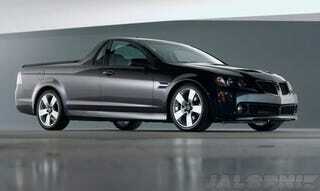 REPORT: The Pontiac G8 El Camino, GXP Live... As Holdens! Holden's readying a limited edition version of its Commodore SSV with Pontiac's twin-nostril grille and hood scoops. According to Australian sources, the special edition will be called the Commodore G8 SSV and be available as a sedan, ute and wagon! Apparently, the move to stop the export program in the wake of GM's bankruptcy and the killing off of the Pontiac brand has left a warehouse of parts once destined for cars to be exported to the US. Holden's marketing department — sensing an opportunity — has decided to use the stockpile on VE Commodores, which will be sold as a premium priced, limited edition Holden. Brilliant! Even better news is the special edition will apparently also be available as a ute and wagon! GM had announced plans to bring over a G8 El Camino Sport Truck ST to the United States but then nixing those plans, along with even the idea of a wagon version of the Zeta-platformed RWD G8. Although there's no official confirmation yet from Holden, the mere thought of the G8 surviving provides us some level of comfort — even if we're not getting it here. Frankly, the mere thought of a Pontiac El Camino vastly increases the likelihood we may have to move to Australia for some good ol' fashioned muscle car hoonage! Seriously, this is the best news we've heard in weeks. "It is unclear how many of each will be made, but dealer contacts have suggested it will be close to 1500 in total, or about 500 of each body style. Pontiac G8 SS-V wagon manual $57,290"